Display Backdrops, Banners, Pop-ups & More! If you are involved in trade shows throughout the year, Tower Media can help you create an exciting image for you and your company. From simple table top displays to complete booth design and custom props, we can handle everything for you right here. We specialize in interactive games tailored to your industry and message. 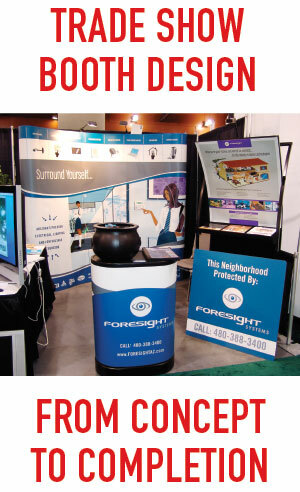 Trade shows move quickly and the competition for your customers attention is fierce, don't let this opportunity slip by... make an everlasting impression on them. Tower Media can also supply promotional give-away items for your trade shows as well as printed brochures and other marketing or presentation materials. Whatever your customer takes with them at the show is how they will remember your company. Make sure your brand stands out in that Swag Bag!